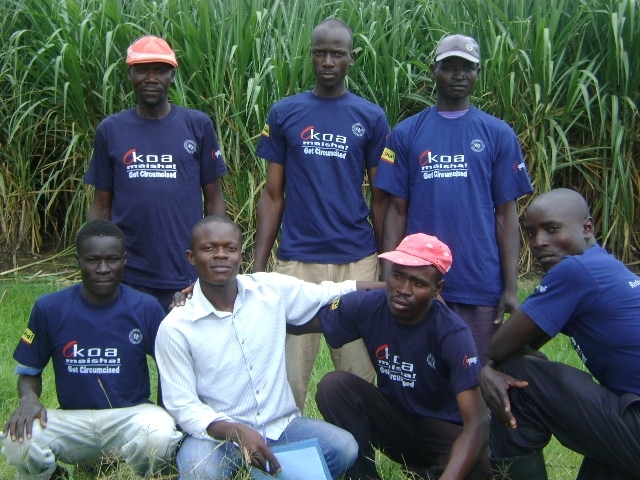 IRDO’s Voluntary Medical Male Circumcision program is supported by PEPFAR through a cooperative agreement with Centres for Disease Control (CDC), and is currently in its third year targeting the sexually active populations ranging from 15-49 year olds. The program’s goal is to expand VMMC services in Kenya to reduce the spread of HIV among currently non-circumcising communities. Key activities in the intervention include supporting the Ministry of Health in rolling out VMMC, as well as offering VMMC services at IRDO centers and in mobile and outreach settings. Currently the program is supporting the Ministry of Health in 7 districts in Nyanza including Kisumu East, Nyando, Suba, Rongo, Migori, Homabay and Nyatike. From July 2010, IRDO spent 6 months setting up VMMC services in Nairobi, and circumcised over 7,000 men. Other activities in the program are training of Ministry of Health staff to provide the service and improving the quality status of facilities, awareness creation and service provision. The program also has demand creation strategies including night service provision, radio programmes, campings, mobile outreaches, mobilization using friendly community mobilizers and roadshows. The program has provided over 110,000 males with VMMC services since its inception in October 2008. Walter Odongo, 57, from Kajulu in Kisumu East district came for the service so as to gather confidence to convince his nine sons to go for the cut. According to him, information targeting the older populations should emphasize the benefits it has for spouses like preventing Cervical Cancer. His justifying moment to come in for the service reached when he bathed in a river with many youthful males who had had VMMC and felt a little challenged. In Oremo, Nyando district, Peter Otieno, 54 and his sons of 18, 19 and 23 years made a call and got directions to the IRDO centre in Nyando where all of them had VMMC. According to Mr. Otieno, health issues regarding AIDS, STIs and sexuality are no taboo in their homestead and they talk about them freely and openly without fear or embarrassment. This was actually why they resorted to come together as a family. His wife was away at the time of service but Otieno says she knew of their coming and could have joined them as well save for other commitments that were keeping her busy. where are your offices in Nairobi?My husband would like to hav a VMMC. The roll – out is great, we need to support the effort by mobilizing our close friends to access the services. Kudos IRDO!!!!! Lets mobilize more older men to access the services. Welcome to IRDO Community Interactive Forum! !